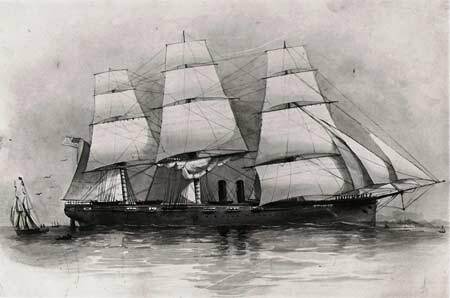 The USS Niagara was provided by the United States government to assist in the Atlantic Cable expeditions of 1857 and 1858. Although the ship was built in 1855, the expedition of 1857 was the Niagara's first voyage after she was commissioned. 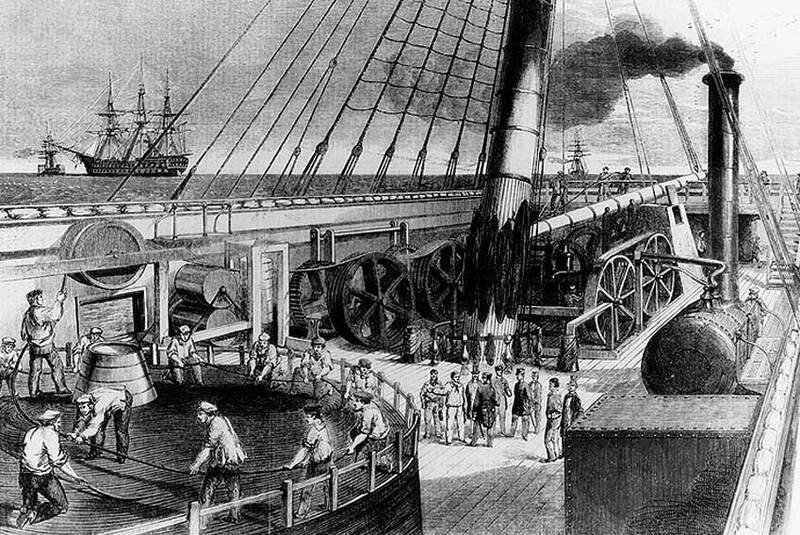 The voyage to England to join the cable fleet is described here by the correspondent of the New York Daily Times, and is illustrated with contemporary drawings. 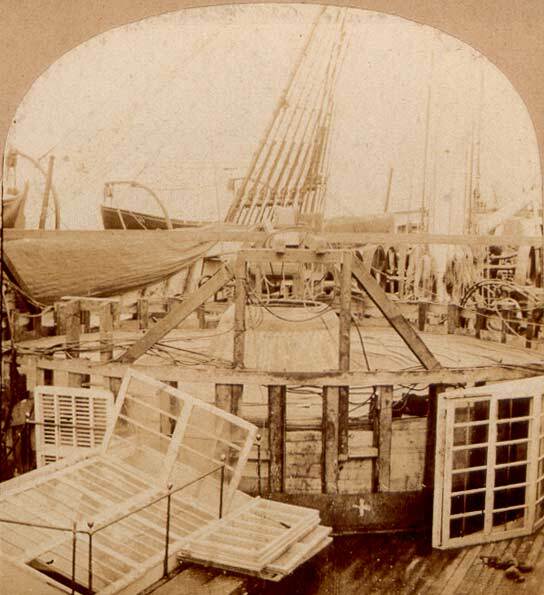 This page also includes original stereoscopic views of the Niagara at work, taken during the cable voyages of 1857 or 1858. Special Correspondence of the N.Y. Daily Times. April 24, at 7¾ P.M., pilot and visitors all left the ship. We parted with three cheers, and another for luck. At 8¼ P.M. stood upon our course, under sail and steam—foresail, topsails and jib. 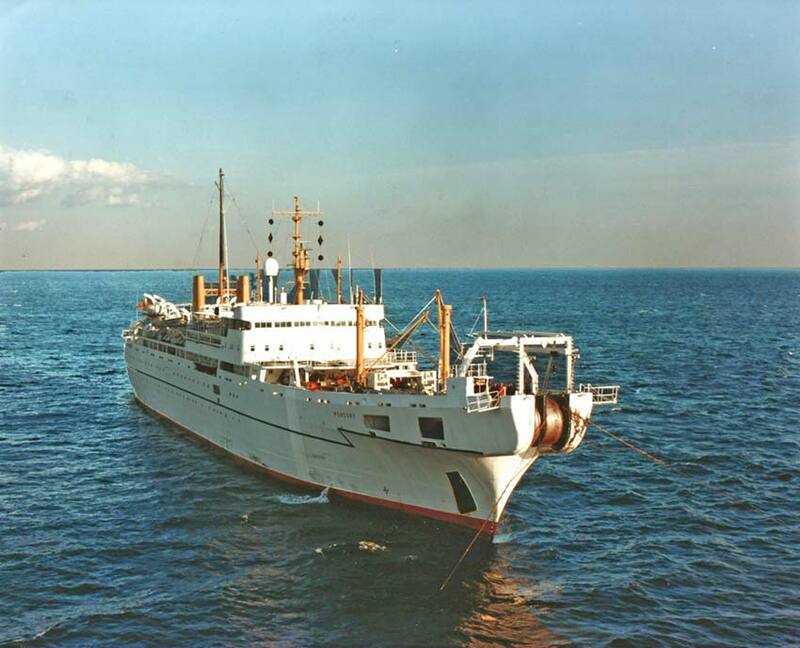 At 8½, took our departure 10 miles distant from the outer buoy at Gedney's Channel. Course 25th, E. b. S, ½ S; revolutions, 41; speed, 11 knots average during the night, course East, wind N. W. and S. W.; distance run, 168 miles, at 38.3 revolutions; lat. 40° 22' W., lon. 70° 28' N.; smooth sea and light winds. Owing to some wrong turn in a connection with our propeller when we first stood off and started the engine, we thought our cruise had come to a sudden end, or at least to an indefinite postponement. Fortunately no damage was done, and in fifteen minutes we were on our way, let off for the fright, and ever since we have been running on under sail and steam, with very light winds, as quietly as though we were in a mill-pond. Owing to the winds having been so light, we have had no chance to judge what she will do, but it is certain that she can steam up to 9 knots at the least. 26.—at 8 A.M. had run 183 miles, average speed 9 knots 4 points, revolutions 29. At 12 M., 32½ revolutions, speed 8 knots, 4 points, wind very light and variable, from S. to N. W. Dist. 217, Lat. 40° 8' N, Long. 65° 55' W. To-day being the Sabbath, all hands mustered upon the spar deck, and prayers (Episcopal) were read by Capt. Hudson, and afterwards a sermon, which might have been very good for aught I know, as owing to the flapping of the sails and the working of the propeller, I only caught a word here and there. One thing I am sure of, however—it was too long; and a violent cold I caught over a damp deck for over one hour and a half, and the expenditure of muslin upon my nasal organ, don't make me like it any the more. Brevity has long been allowed to be the soul of wit; it is equally certain that it is as fully important to the effect of a good sermon. 27.—Nothing has occurred out of the regular “routine” during the last 24 hours; at 7 A.M., making 13 knots with 40 revolutions. 2 A.M. 13 knots, 4 points 36 revolutions, average speed 10 knots, 4 points, wind from S. W. to N. E., variable; thermometer 50. Distance 2,564, lat. 40° 39'. 28.—60° 30'. From 9 P.M. 27th to 4 A.M. 28th under steam, speed 8 knots 9-10, wind variable from N. to S.S.E., lat. 41° 26', long. 50° 31', Distance 2196—at 12 M. revolutions 39.2, lowest for 2½ hours 31.3. At 4 A.M. made sail fore and aft, at 6 topsails and jib; split the main topsail, owing to keeping fast bunt jigger. Began to feel the influence of the Banks, in hazy weather and occasional squalls. At 2 P.M. going 13 knots close-hauled, ship rolls a little but comparatively nothing worth speaking about. 29.—At 5½ called all hands to reef topsails. Average speed during the night, 12 knots; 1 point, wind 8. E. by S. half S.; ran 281 miles up to 11:20 A.M., 23 hours 20 minutes; in the 24 hours, 292 miles. 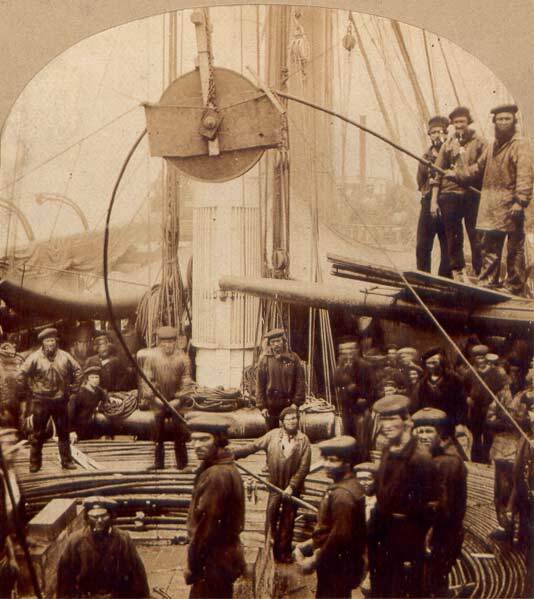 At 4 P.M. sent up new mizen topgallant mast, crossed mizen topgallant and royal yards; average revolutions 36; lat. 41° 46', lon. 49° 10' W.; would have made 300 but for the decrease of the day and low steam during one hour of the night. Thermometer, 58°. 30.—At 12 M. 40 revolutions; speed, 10.4; distance, 236.4; pleasant and smooth sea, and wind very light during the night under very low pressure of steam, from 5 to 10 pounds to the inch and no fire under the two after boilers; not making more than 20 revolutions per minute. The machinery still working as smoothly as could be desired, and the ship working like a beauty, as she is. At 10 A.M. general muster. “The Regulations and Rules” for the better government of the Navy read in presence of the officers and crew, and subsequently they were mustered. Lat at 12 M. 42° 7' 36"; lon, 43° 29' 20". Made good distance, 254 miles. Subsequently, at 3 P.M., all the officers and passengers met at dinner in the wardroom, when everything passed off very pleasantly, and if we can draw an inference from the strong enthusiasm of all, from the Captain, and Professor Morse, down through all the different grades of officers in the ship, most surely we have every reason to believe as well as hope, that our enterprise will be successful. We have not as yet fairly tried the ship, either under sail or steam, or with both acting together, and for a reason. It is scarcely worth while, upon an experimental cruise, to force on and break down, whether or no, “Tom Collins,” and thus defeat the object for whose accomplishment we are sent out, and which if accomplished would be of more importance, not alone to the United States, but to the world at large, than the cost of a dozen such ships as this, officers, crew and all. As a matter of well-known experience, our engines will work better when they have run a while, than at the first going off. Even now, at the end of some six days' trial, we are so satisfied with her perfections that beyond a doubt she will be forced up to a greater speed than at present. We shall see. We have gone 9 (nine) knots under steam alone, and over 14 (fourteen) knots with sail and steam, and that in a very light breeze. Do not be astonished should you hear of 17, or even 18 knots. May 1.—Average revolutions, 36.3 during the night, smooth sea and calm; speed 8 k., distance 224 miles, lat. 42° 62' N., lon. 38° 21' W., wind westerly. 2,—At 10 A. M., showed our colors to an English barque bound to the Northward. At 11 squalls of wind and rain, wind northward and eastward, reduced sail to reefed topsails. At 12 M., lat 43° 53' W., lon. 32° 48', distance 261 miles, average 10.6 knots. 3—At 2 P.M. blowing quite fresh from northward and eastward, rain and slight sprinkling of snow; according to present appearances shall be at least 14 or 15 days on the passage, but we have neither carried sail nor burnt coal with “enthusiasm” as they say at “Laura Keene's,” but on the contrary in the greatest moderation. 4.—Showed colors to an English ship standing to the westward. Ran 240 miles, lat. 44° 30', lon. 27° 19', Heavy sea and strong gales from northward and eastward, with showers of rain and hail, came very near losing masts. 5.—From eight to Meridian at nine, carried away the port forwards, swifter of the main rigging; also the forward shroud; called all hands, shortened sail, furled the topsails and foresail, and commenced setting up the main rigging, having first secured the mast with pennant tackles. At 10 A.M. carried away the fore try-sail gaff; unbent the sail. Discovered that the chain parts of the shrouds were defective; the links which were carried away appeared to have been only half welded. At 6 passed a ship standing to the westward, another on the starboard beam; set up all the rigging; under steam alone, making two to four knots; wind dead ahead; ship rolling very deep; heavy head sea, under double reefed topsails (fore and main) and jibs; at 12 M. furled sails and hauled on our course under steam. 6.—At 10½ P.M. furled all sail and commenced steaming; wind East to East by North; lat. at 12 M. 46° 9'; long. 26° 41' 15"; distance per log 106 miles. 7.—Wind E.N.E. ; course East under steam; repairing engine; lat. 45° 50', lon. 23° 18' 54"; distance 100 miles; at 12 M. hove to. 8.—At 9 AM triced up the propeller, turned reefs out of topsails, set courses, topgallant sails and jib; 8 knots with propeller down, close hauled; lat. 40° 52', lon. 28° 36'; distance 115 miles. 9.—Wind fair but squally, with rain. Three sail in sight—beating them all, we under short, they under full sails; lat. 47° 63', lon. 16° 8'; distance 214. 10.—Light wind and fair; several sails in sight, one a French frigate, the Niagara, drawing ahead of all and gradually dropping them out of sight under sail. At 5:05 lowered down the propeller and started all the engines, with sails from topgallant sails. Lat. 48° 2', lon. 16° 16'; light winds and pleasant; several sail in company, under sail. At 4½ started engines. 11.—At 12 M., lat. 48° 55', lon. 11° 9', distance 209 under sail only; from 1:30 A.M., squally with rain; gave our longitude to a Danish brig; at 1.30 P.M. started propeller with reefed topsails, foresail and jib. At 8 A.M., in the longitude of the Lizzard nearly, very foggy, course E.S.E. to E. by N., making 13 knots. 12.—Lat. at 12 M. 49° 21' Lon. 5° 19' distance 224 miles; at 6.30 took a channel pilot; at 3 A.M., Isle of Wight bore N. by W.; at 5 A.M. Coast of France in sight; at 8 AM off Beachy Head; at 11 A.M. off Hastings; at 7 A.M. clewed up all sail and under steam only. 13.—At 12 M. off Dungeness, distance 244 miles; came to anchor at the Mouth of the Thames at 8 P M.
The Log will satisfy all those who take an interest in the performance of the noble ship of her admirable sea going qualities. We are now anxiously waiting to learn what our next move will be, and when we shall commence taking on board a cable; respecting which, we are not correctly informed. I shall be able to give you more definite particular by the next steamer. See also the page on the Niagara showing a souvenir anchor made from wood taken from the Niagara when the ship was scrapped in the 1880s, and the Niagara's figurehead. 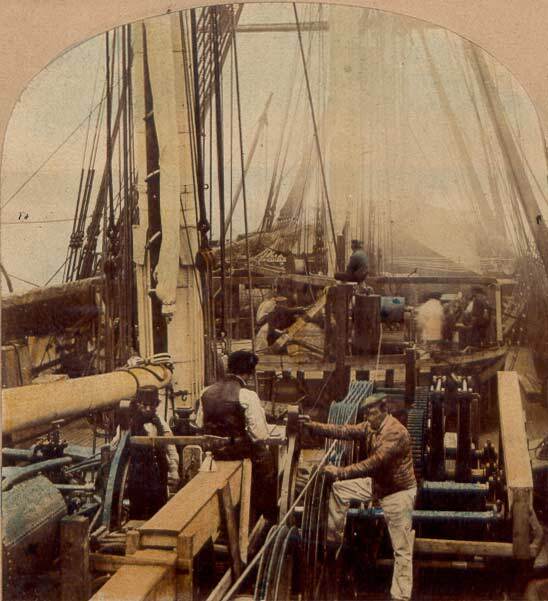 Showing the Machinery Employed in Laying out the Telegraph Wire." Thanks are due to Page and Bryan Ginns for supplying these images. Their website at www.stereographica.com shows many antique photographic treasures. the image from the Illustrated London News, above. Another view of the cable coiled on the deck of the Niagara. 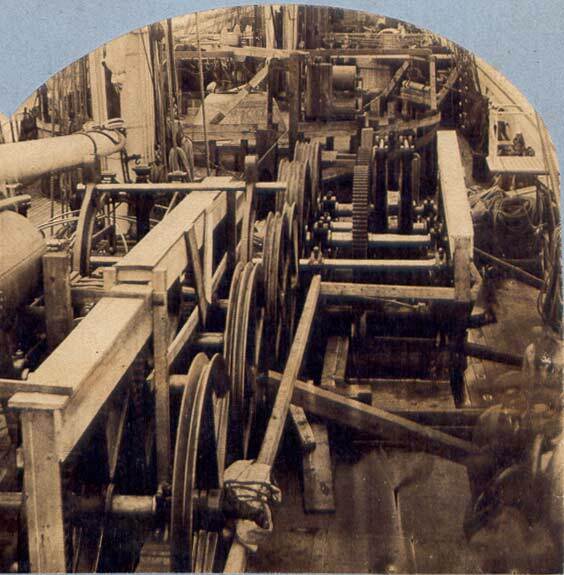 View of the paying-out machinery. Closer view of the paying-out machinery.